I haven't been blogging anywhere, and I had pretty much decided to give it up, especially as I had bought a new computer and it didn't seem to want to link with my old scanner printer. However I needed to print something and so was obliged to spend a bit more time and thought on the problem, and voilà, I now have it working perfectly. First piece, this is from Adelheid Dangela's book "Occhi Patchwork". The book is in German, but the patterns are diagrammed, and easy to follow. The idea is that each pattern is named after a German town, and you can join together all patterns that begin with same letter. Here I have done Duisburg and Dresden. The thread is a size 100 lace thread in a very dark blue. It isn't really ideal for tatting...however I do like the look of it. I rather fear that my tension is a bit off, because Dresden is a bit bigger than Duisburg, and in a bigger piece it would be difficult to continue. I might try again with a more biddable thread, because I like the general aesthetics of the patchwork design. 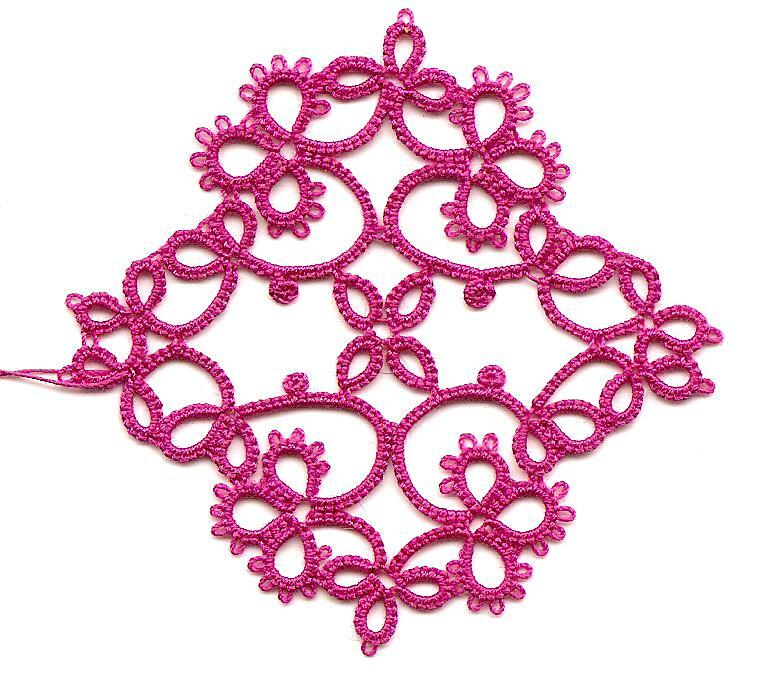 Now although I haven't been posting, and I very rarely comment on other people's blogs, I do check out many tatting blogs every day. I love seeing the work and hearing little insights in their lives. One of my favourites is Tat-ology, and it was reading Fox's blog that was the final nudge to get me to post again. She is so energetic, and updates nearly every day. 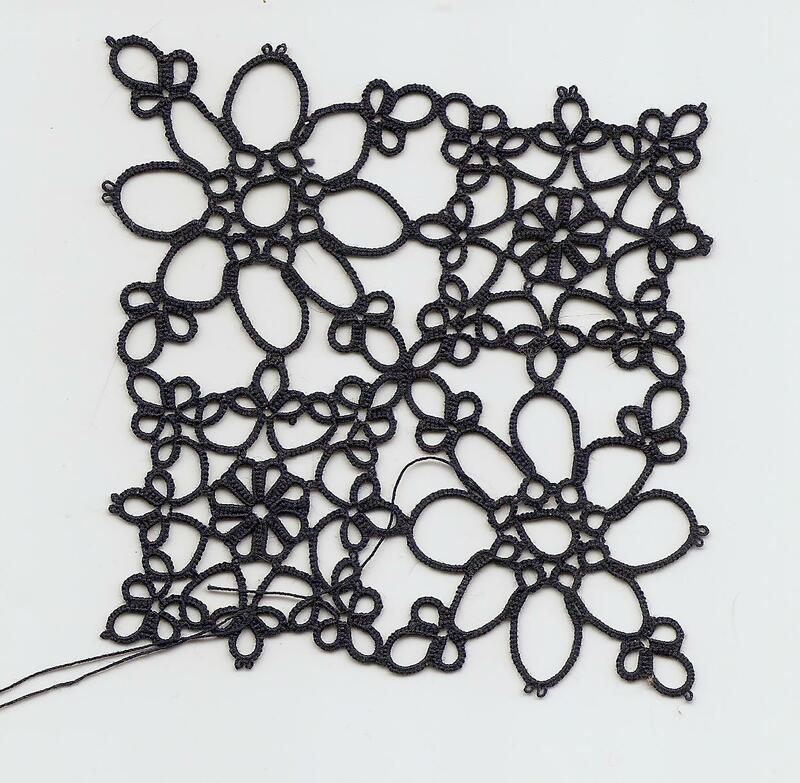 Now this strip is an old piece of tatting but I am including it because I was struck by the way Fox had chosen to do the same pattern from Julia Saunders book! This is in Valdani size 50. 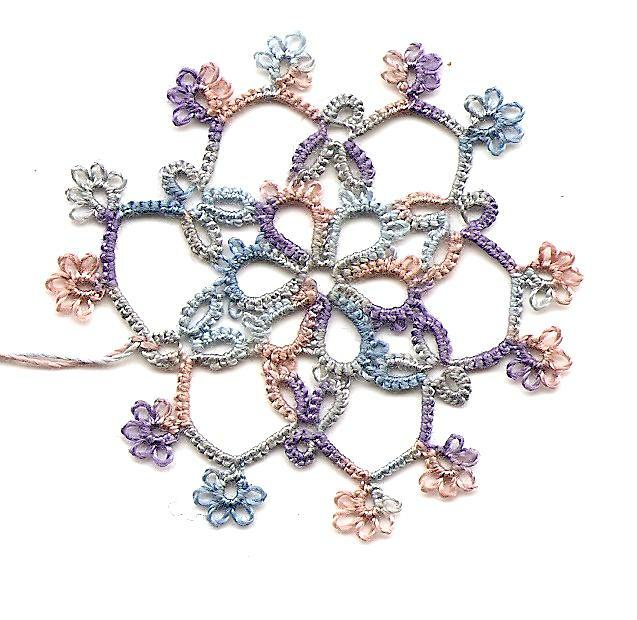 Then I saw that Fox had also chosen to do this pattern from Mary Konior's book Tatting Patterns which I received for Christmas. It was an odd little motif, and I was surprised at myself for choosing it, so it was extra weird when she chose to do it too. This is made in lovely DMC dentelles, which are really my absolute comfort zone thread. And just to finish off, here is another motif from the same book, this time in Gütermann Sulky thread. I wonder if anyone else notices that someone else has chosen the same pattern as them. Well I'm VERY glad to see you back and also very pleased you've got all your problems sorted. Snowy! How lovely to see a post! Your work is stunning - the stitching is so consistent and the thread is so small. That is why I always look forward to seeing what you have tatted. The Occhi Patchwork piece is amazing. I still have the very fine silk thread that I received from you last year, but am afraid to touch it, as I do not think I am proficient enough to tat with it yet. Soon, I hope, but when I admire your tatting, I see I have a way to go yet! I wonder what you are working on now. Maybe we are sharing another pattern! 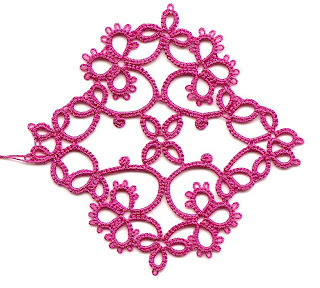 Love to see all that beautiful tatting! Glad to have you back and that you did not give up! The Occhi patchwork is great. What a nice idea to make matching designs. Seems like a very nice book to me. Hope to see more of your work soon again. Stay with us! Your navy blue tatting is stunning! I'm so glad that Fox inspired you to keep up blogging! I just came across your blog today and your work is very lovely!